This award has been presented since 1975. It was originally known as the Rube Hornstein Prize in Operational Meteorology. In 1998, the award became a medal and was renamed. Mr. Rube Hornstein was the first recipeint of the award as a medal. Rube Hornstein was raised on a farm in London, Ontario. He graduated as gold medallist in honours physics from the University of Western Ontario in 1934 and received his MA in physics in 1936. 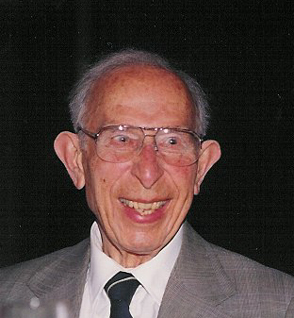 He obtained his MA degree in meteorology from the University of Toronto in 1938. In 1938, he joined the meteorological branch of the federal Department of Transport and from 1938 to 1940 he was a forecaster at St. Hubert and Malton Airports. In March 1940 he was transferred to Halifax as officer-in-charge of the meteorological section of Eastern Air Command, administering meteorological services for all three branches of the Armed Forces from 1940 to 1946, with special emphasis on the RCAF Coastal Command and the naval convoy operations. His service was recognized by the granting of membership in the Order of the British Empire, by King George VI in 1946. From 1946 to 1972 he was officer-in-charge of the Halifax Atlantic Weather Centre. He began doing radio reports for the CBC in 1946 and hosted a popular show called "Ask the Weatherman". When the CBC launched a TV news program, Gazette, in 1954, Mr. Hornstein did the weather forecasts. Among the many honours bestowed upon him were the Patterson medal for distinguished service to Canadian meteorology in 1962. He was a Life Member of CMOS . "He was just one of the last great gentlemen," said Don Tremaine, a longtime friend and television colleague. "They don't make those birds anymore."